Man, how long has it been since Metal Gear Solid 4 was released? I think it was in 2008. That's six years ago, and an entire generation or two little humans have already become self-aware in that time span! Not to mention millions of teens can now legitimately pick up the game without their mom's help. Better time than ever to put this modern-classic back into the fold. 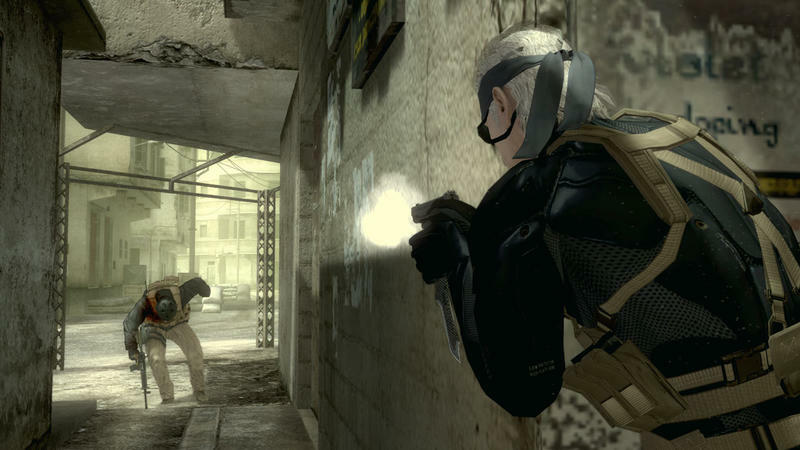 Metal Gear Solid 4: Guns of the Patriots has been confirmed to get a long overdue digital release on the PlayStation 3 this coming Dec.16th. Konami has confirmed the price at $19.99, and it will be a whopping 30GB download! That's bigger than most PlayStation 4 games I've played! Metal Gear Solid 4 was supposed to be the final chapter and wrap up video gaming's most convoluted and over-written storyline, and for the most part, it succeeded. Solid Snake retires himself, Big Boss has one last chance to make a case for his global power struggle, Raiden becomes a cyborg, and Revolver Ocelot still twirls his gun a lot. Oh yeah, and the climax of a decade of storytelling involved two sweaty old men beating the stuffing out of each other on the roof of a boat. Not the best way to wrap up a stealth, tactics, and espionage action franchise, but not totally unsatisfying either. As for wrapping up the franchise, well, that's a different story. Konami, realizing that most of its other famous franchises have been run right into the ground, still needs Metal Gear Solid for the prestige factor on the gaming scene. This is why you are seeing both Metal Gear Solid V: Ground Zeroes and Metal Gear Solid V: The Phantom Pain being released over this and next year. It's also why Metal Gear Solid 4 is getting this re-release. It's a solid game, but it's hardly the best the series has to offer. The first game still feels groundbreaking after all these years, and Metal Gear Solid 3: Snake Eater still sits firmly at the pinnacle of this franchise. Play at least those two first, and maybe Metal Gear Solid 2: Sons of Liberty, before taking a bite out of this fourth entry. Once this download goes live, the entire franchise can be downloaded to your PlayStation 3 and you'll never need another Metal Gear Solid box again.